A beautiful unique antique residential home with a bunk house, WiFi, hot tub and short distance to downtown and the ski hill. Red Lodge's mining history is richly absorbed into our downtown, museum, and stories. This beautiful newly renovated residential home, Peace of Mine, is located a few blocks west of our main street and sits in a cozy section of town. Offering high ceilings in the living room, beautiful furnishings, modern amenities, with touches of historic moldings, etc. 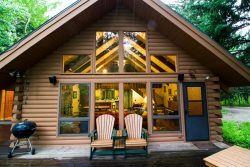 this large, well appointed home and guest cottage (equipped with full kitchen and bath) will host up to 14 people in new comfortable beds. Bring your extended family and bring your friends. Enjoy soaking in the hot tub while gazing at the Milky Way. Cook a delicious meal in the galley kitchen with its new appliances and dine together toasting your time in Red Lodge! Your stay will bring you Peace of Mine! Extras this home has: Propane BBQ, Games, Books, Crock Pot, Large Seasonal Deck, Fenced Yard, Fans, 60 inch Roku TV in main home and 43 inch Cable TV in the bunk house. Great experience. I would just say that having some cleaning supplies would have been helpful. I.e. to sweep up after a meal, etc.